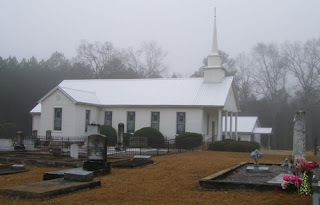 I've been planning to take a trip to Russellville Baptist Church Cemetery in Monroe County, Georgia ever since I researched a bit and wrote a post about Grady O'Neal and his wife Josephine Harbuck (Grady O'Neal & the Girl Next Door). According to an online transcription for this cemetery, Grady's mother Martha Baggarley O'Neal is buried in this cemetery. I decided to pay a visit and my respects. Since this week's "Genealogy Blogging Prompt" is to take a genealogy day trip and write about it, I figured I'd pay a bit more attention to my entire journey from start to finish. I actually started preparing for my trip the night before. I printed out directions to the cemetery, along with a couple of maps. My might-as-well-be-husband used to install satellite systems for DirecTV, and he told me a bit about the area since he had done some work there. He even told me a place I should stop and eat (I didn't, though). The next morning, I charged the batteries for my digital camera. The fluids in my car were properly checked by my guy, and I was told to watch my surroundings. I rolled my eyes and said ok, but it is something to keep in mind. I was taking a trip to a place I'd never been, and I was doing it alone. Being mindful of my surroundings is only common sense. Finally, I was on my way. The weatherman had said it was going to be partly cloudy with a high of 72. When I began my journey, it was 40+ and foggy. I was listening to the radio, alternating between country music and light rock. When I got away from the main cities in the area, I entered rural Georgia. The drive was pleasant, though foggy. Since the fog limited my vision somewhat, I think I saw more of my immediate surroundings. Sometimes, when I'm looking at the scenery, I tend to look far into the distance. Today, I was looking at what was right off the road. I saw peach orchards, pecan orchards, cotton fields, and tree farms. Almost all the houses had some sort of satellite dishes in their yards. Either cable doesn't run, or it is not popular out here. Traffic was minimal. I saw more 18-wheelers than regular passenger cars. I eventually arrived and traveled through the city of Roberta. I've visted there before. I made a mental note to stop at their main cemetery on the way home. Next, I went through Musella. There is a huge farm there. While it was quiet on this January day, I have been there in warmer climate. That is when they have their fruits and vegetables on display for sample and purchase. It's bustling then. Once through Musella, I took a quick right toward Russellville. A little ways from Musella, large properties were still common. Now, though, they all have horses. 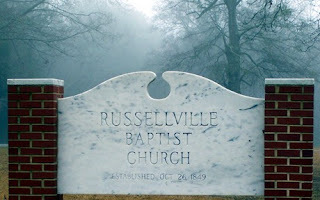 Eventually I reached the Russellville Baptist Church and cemetery, which was established 26 October 1849. The fog, though a little more patchy, was still present. The church was very pretty and white with beautiful stained glass windows. The cemetery was a mixture of old and new stones. There was a wonderful silence and peaceful stillness about me. The only sounds I heard were made by the birds in the many trees surrounding me. I found exactly what I was looking for, and more. Martha Baggarley O'Neal was there, but I'm still not sure if her husband is. There was no sign of a grave next to hers, but there was definitely room for one. Martha's gravestone appears to have been added some time after her death. I also found more Baggarleys, Harbucks, and O'Neals. Of course, I took several photos of many tombstones. They will be part of later blog posts, for sure. The following is one photo I really like. These three angels were lined up all in a row. In front of each one was a gravestone for a member of the ALDRIDGE family: Avie A. Aldridge (Aug 20, 1909 - Oct 7, 1988), George M. Aldridge, Sr. (Apr 21, 1907 - Aug 15, 1981), and George M. Aldridge, Jr. (May 28, 1935 - July 15, 1999). Once I was done taking several photos and trying my hand at a short video, I was on my way towards home. 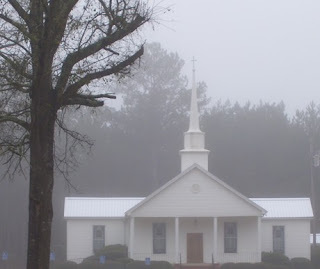 On the way out, I stopped and took one last photo of the church in the fog. I do not know a whole lot about the Russellville community. The following map shows the cross street of Abercrombie and the street just to the north of Treadwell. Both of these names were found in the Baptist church cemetery. Before I get to the video, let me give you a quick overview of the rest of my "genealogy trip:" I did as I told myself to do and stopped at the Roberta City Cemetery on my way back through. I spent some time there taking more photos. Once I got back home, I decided a nice bowl of chili sounded nice. Believe me, it never reached 72 degrees. Afterwards, I fixed myself some chocolate chip muffins for dessert and breakfast tomorrow. Then I began loading my almost 200 cemetery photos onto my computer. Not long after that, the blogging began. I loved the video! That's a really nice way to capture the atmosphere of the cemetery. The video adds such "depth" to this post! The beautiful photographs, colorful descriptions and perfect video of the white-steepled country church make this trip really come to life. Excellent! I need to try doing that too! Didn't think to load video to YouTube so that I could embed it in the blog. Great thinking! Thanks, Andrea! I've been playing with video off and on -- nothing too fancy, yet. I think it adds a lot to the "experience" for viewers. Col. John A. Dunning -- Do I Have the Right Man? Tombstone Tuesday - Edward Rutledge, Esq.